My 17th week in Amy Johnson Crow’s “52 Ancestors in 52 Weeks” family history blogging challenge. I’m closing the gap at just 5 weeks behind in this series (the challenge is on week 22). I initially blamed my tardiness on being super busy at home, work, and with my volunteer work. However, the extended lapse can be blamed on the recent diagnosis of some critical health issues that had wiped me out for a while (you can read about that on my food blog). But I’m determined to chronicle at least 52 Ancestors this year, so I’m playing catch-up. My 17th “ancestor” is my Flanagan uncle, whose first and middle name, and biographical facts, are being withheld for privacy reasons. The real focus of this post is the following photo. However since the challenge is supposed to be tied to an ancestor or relation, I’m assigning my uncle to that role. My Uncle’s 1970s wedding. My grandparents, Michael John Flanagan and Elsie Charlotte Hayes are in the middle. I’m in the front row center, wearing the pink dress and a scowl face. This post came to mind because I shared this photo on Facebook today for Throwback Thursday. It is one of the only photos I have of my Mom’s entire family, and it is one of my very favorite family history photos. Because it is so awesome and so funny — the epitome of 1970s fashion. Check out the tuxes that my grandpa Michael John FLANAGAN (1927 – 1997) and uncle (the groom) are sporting. How about those disco era dresses my uncle’s sisters are wearing (Saturday Night Fever, anyone…)? Except for the dress and hat my flower child aunt in back is wearing. 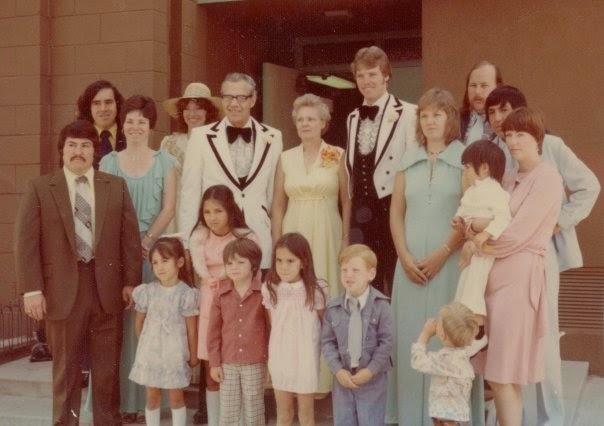 And while you can’t see it in this photo, most of the men are in leisure suits (my poor cousin on my left got stuck in a little boy’s leisure suit!). 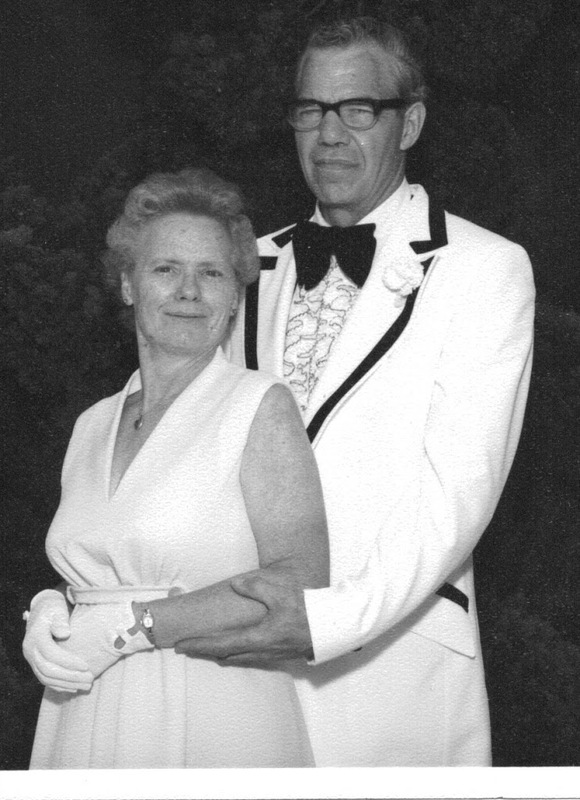 Ironically, my grandmother, Elsie Charlotte HAYES (1926 – 1992), is wearing the most normal looking dress…and she had hideous fashion taste, usually choosing polyester pants. 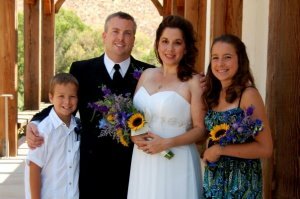 It must have been a long hot ceremony (probably a traditional Catholic one, out of respect for the bride’s family), because all of us kids are scowling, as are many of the grown ups. The parents of the groom, my grandparents Elsie and Mike. 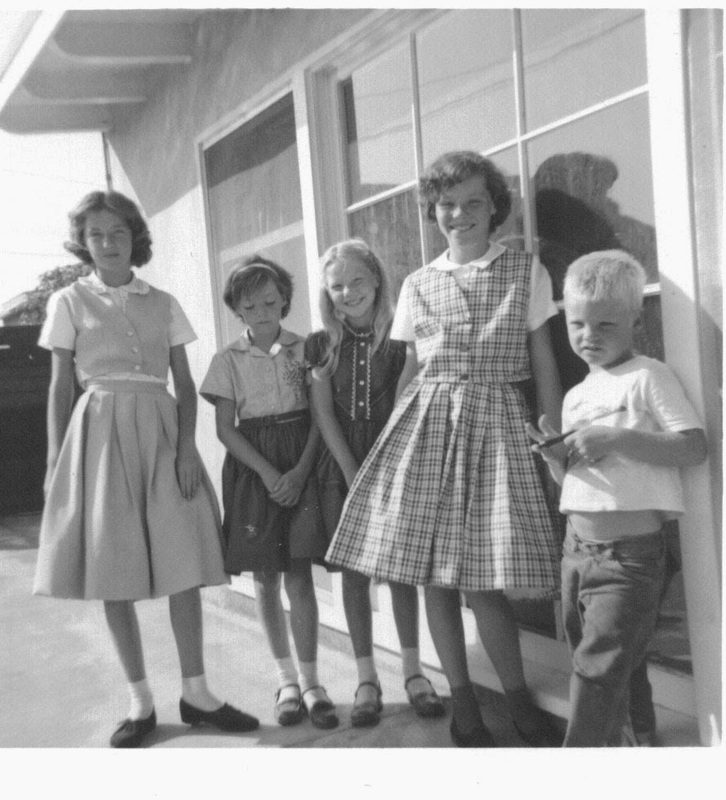 My uncle and his sisters, as children, at their home in Santa Fe Springs, California. 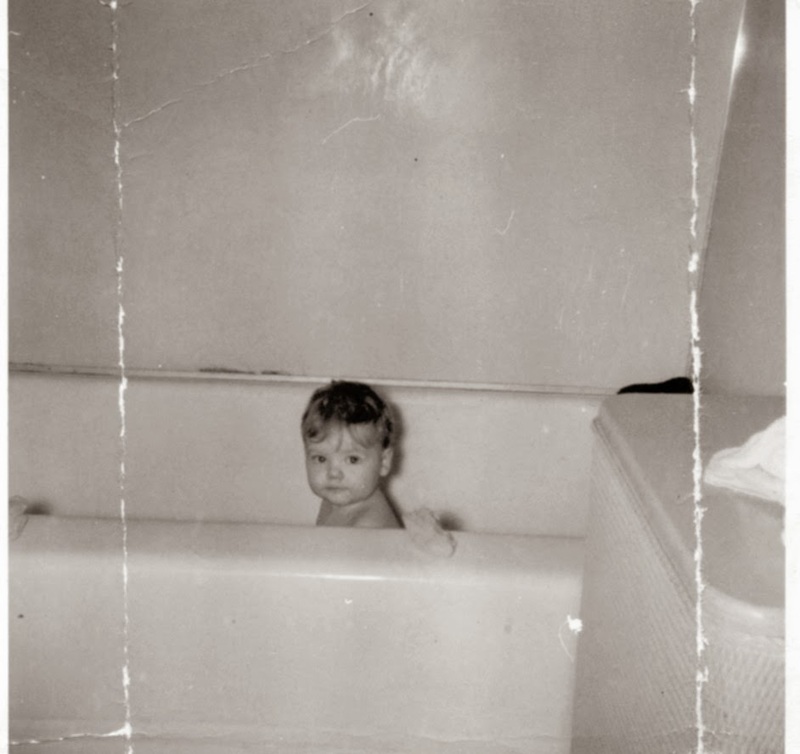 The groom, as a baby. My uncle, the baby of the family, is quite a bit younger than my mom. He is about halfway between Mom and me in age. So he was just a young teen when I was adopted as an infant and joined the family, and Mom tells me how much my uncle used to love to play with me and babysit me. I remember nicknaming him “The Monster” as a little girl, because of how much he liked to rough house with me. I was the only niece or nephew he ever allowed to sleep in his bed when I spent the night at my grandparents’ house (because I was his favorite). Uncle absolutely adores kids and spends much of his retirement with his two little grandsons. My uncle whisking Jeff and me away from our wedding reception on his speed boat. 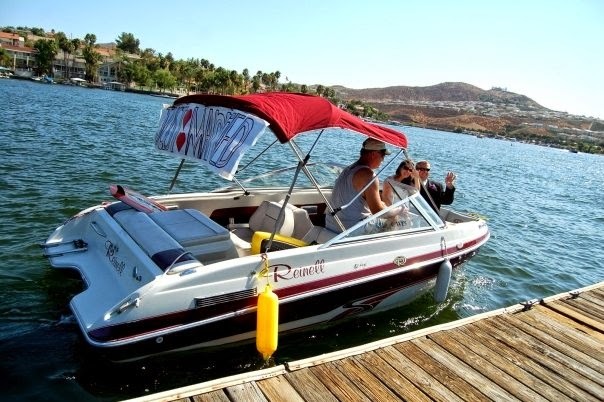 We held our reception at Canyon Lake, California, where my folks live, and I wanted a memorable exit. Uncle had a change of clothes stashed in the boat, and when it came time to make our departure, he took us across the lake to my parents’ house where Jeff and I could change and head off to the airport. We had a blast as boaters, water skiers, and beach goers on the lake this gorgeous day cheered us on. My nephew surprised us with the “Just Married” sign.